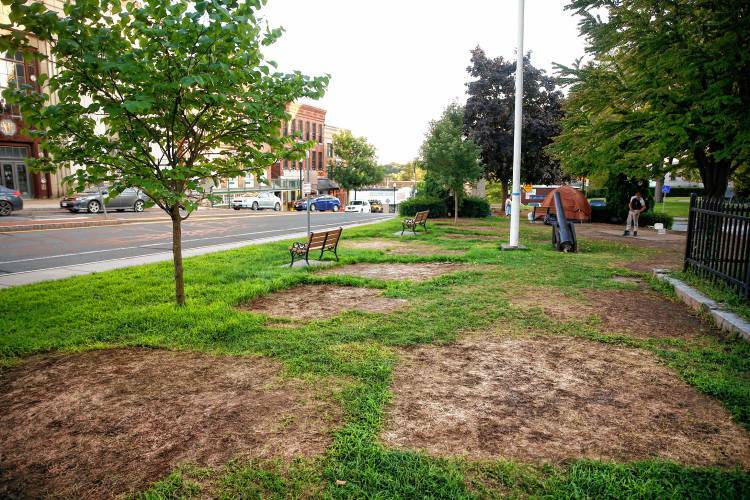 GREENFIELD — The tape and sawhorses will be removed and the benches will be put back on the Common on Monday, according to Department of Public Works Field Superintendent Paul Raskevitz. Starting in August, the Common was closed to allow for cleaning and reseeding, after about 20 homeless campers were evicted from the Common where they had been for most of the summer. The grass had been trampled and died where tents had been pitched. After town officials initially allowed the camping thinking they had no legal means to evict the squatters, the Board of Health and Board of License Commissioners concluded they had jurisdiction and ordered the campers off the Common. Mayor William Martin says that when the Common reopens, there will be no overnight camping and no temporary housing allowed without a permit from the Board of Health. Greenfield Police Chief Robert Haigh said the department has heard rumors that people are going to be returning to the Common after Oct. 1, but whether or not the rumors are true – no one will be staying on the Common overnight without going through the proper channels. He said the police do not intend on arresting people, unless a person violates the law. He said he could see cause to charge people with destruction of property if damage is caused like it was in August. Martin said there will be signs posted on the Common stating “no overnight camping,” and if someone were to be in violation, Haigh said there would be a trespassing situation. “I don’t think sleeping on the Common is safe for anyone, and I don’t want to see that happen again, but anything with a police end-all, be-all, where we are the bad guys and go on and kick them out or do a fine – I don’t think that would give us the teeth we need either,” Haigh said. Although people are not allowed to camp on the Common without permits, the topic of homelessness is still being discussed by the City Council. In the City Council Community Relations and Education Committee meeting on Monday, a discussion on homelessness was added to the agenda to give the committee and residents an update. Senior Vice President of Shelter and Housing, Vocational and Addiction Services at ServiceNet, Jay Sacchetti, spoke with the committee about updates to its Wells Street overnight emergency shelter, including an addition of 14 beds for individuals from November through January. There are a total of 22 beds currently at the shelter. The increase will bring it to 36 beds. He said once the bathrooms and alarm systems are completed, the project will be completed quickly, hoping to have the expansion open on Nov. 1. Sacchetti said the shelter currently runs on $220,000 a year to provide two shifts of staffing seven days a week, with two meals a day. Mass said he hoped the governor’s housing bill would pass in the informal session of the Legislature that has additional money for homelessness, urging Sacchetti to look into it. “Are there any barriers or road blocks that the city is putting up to you providing the additional service you provide?” Mass asked. He said in other ServiceNet locations like Northampton, Pittsfield or Orange, some towns provide federal community development funds or the United Way of Franklin County has helped provide some funding. However, the issue of homeless isn’t going away or getting resolved any time soon. Sacchetti said at any of the SerivceNet shelters there is a 40 person waiting list year round.